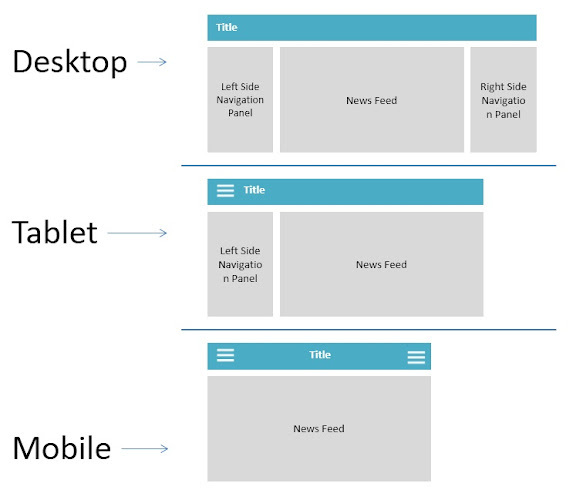 Implementing Responsive web design with Angular Material UI is very easy. It is having predefined directives for different views (mobile, tablet, desktop). You need to understand them and use them in proper way. show-sm Shows element on devices less than 600px wide. show-gt-sm Shows element on devices greater than 600px wide. show-md Shows element on devices between 600px and 960px wide. show-gt-md Shows element on devices greater than 960px wide. show-lg Shows element on devices between 960px and 1200px wide. show-gt-lg Shows element on devices greater than 1200px wide. Observe the below table. These directives implements "display:none" CSS property based on width of device. hide-sm hide element on devices less than 600px wide. hide-gt-sm hide element on devices greater than 600px wide. hide-md hide element on devices between 600px and 960px wide. hide-gt-md hide element on devices greater than 960px wide. 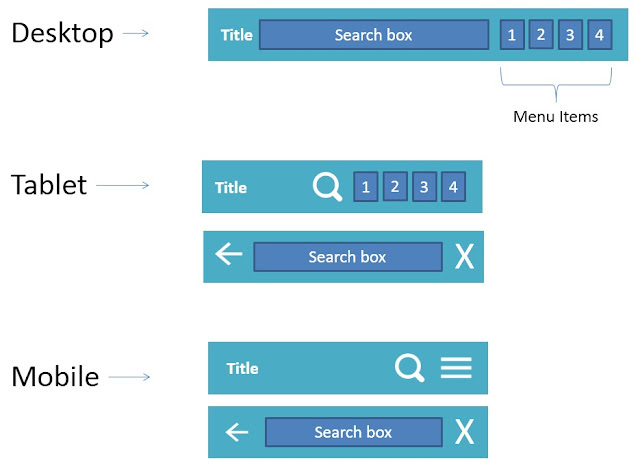 hide-lg hide element on devices between 960px and 1200px wide. hide-gt-lg hide element on devices greater than 1200px wide. flex-sm width percentage of element on devices less than 600px wide. flex-gt-sm width percentage of element on devices greater than 600px wide. flex-md width percentage of element on devices between 600px and 960px wide. flex-gt-md width percentage of element on devices greater than 960px wide. flex-lg width percentage of element on devices between 960px and 1200px wide. flex-gt-lg width percentage of element on devices greater than 1200px wide. Observe below diagram. Desktop and Tablet and Mobile are having different views. Lets implement this with above directives. Observe below diagram. There are 3 panels (Left side, news feed, right side). In desktop view, all 3 panels are visible. In tablet view, only left panel and news feed are visible. In mobile view, Only news feed is visible. making sense !! thank you !! I want to hide some div if width in less then 1080 other wise show that div. How can i achieve this. Please suggest. Never thought that, that think we can do to angular.js. Nice info! Well explained concept and I will definitely try this. Thanks for sharing. If anyone is looking for website development services I suggest Dotz Web, one of the best web development company. Good Information... Really Like it. Great Information for Designers...Thanks to share it. Thank you very much for sharing your findings. I believe this research will be much helpful in coming up with different things. Web Designing Training Institute in Chennai. visit our adobe muse template created on the basis of Adobe Muse CC 2017, which are easy to edit and customize.